Shawn Brown » Where does all the fish go? Dietary guidelines in many countries encourage the intake of seafood as part of a healthy diet. However, the future availability of seafood is threatened by overfishing, unsustainable farming practices and ocean pollution. The growing global population and advancing ecological threats such as climate change are also placing increasing demands on global seafood supplies. Despite this, in the United States it has been estimated that a reduction in the amount of wasted seafood, has the potential to significantly support increased consumption; without further stressing aquatic resources. 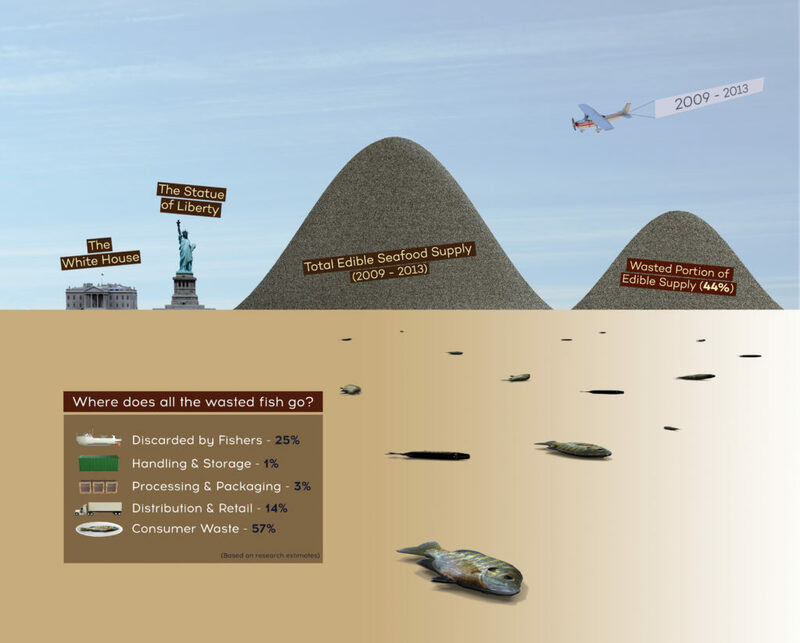 Between 2009 and 2013 around 44% of the edible U.S. seafood supply went uneaten, with the greatest proportion of this loss occurring at the consumer level. If this waste could be recovered for human consumption, it would go a long way to preserving fish stocks in the future. This data was neatly tucked away in a wasted seafood study from the John Hopkins Centre for a Livable Future and begging for some interesting visuals. So I 3D rendered this infographic and shared it with the authors of the study.